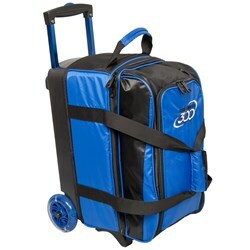 The Columbia Icon Double Roller bowling bag is a great mid priced bowling bag with several notable features. This bag is constructed with quality 600D fabric and has compartments that hold 2 bowling balls and up to men's size 15 shoes as well as lots of accessories. 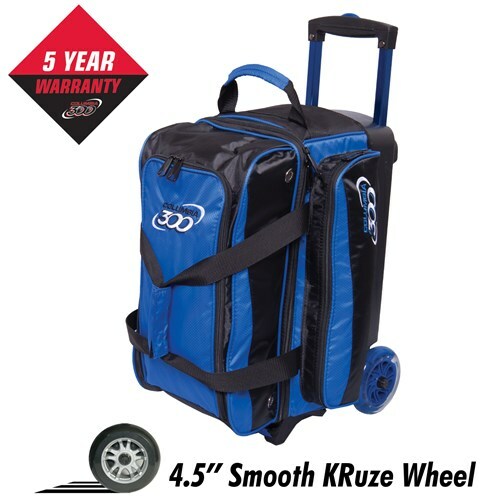 Fun color coordinated handles and wheels give this bag a little extra pop. The roller wheels on this bag are on the only thing that makes it pretty good. The zippers as new are somewhat sticky and don't glide as well as the bag I'm replacing. The volume of the bag is pretty good with nice padding barriers between the balls. The material the bag is made out of is a lot lighter and thinner than my older bag. My older bag was made out what appears to be 500 denier nylon. The new bag almost looks to be about as thick as tent material. It seems to be holding both my 15 lb balls OK, so only time will tell. The bag comes with a 5 year warranty. Will be testing that warranty for sure! Ok...my real beef with this bag. The handle is WAY too short. If you are 5-7 or shorter, it would probably be ok. I'm 5 - 11 and, with the handle all the way out, I'm hunched over like a old man trying to pull it. If I stand up, the bag follows so close to me, it's either hitting my feet when I'm walking, or the caster length is too short, and it wobbles from side to side.......and eventually flops over. I'm already thinking about fabricating a handle extension from my old bag to make it easier to tow. Due to the time it takes to produce the Columbia Icon Double Roller Royal ball it will ship in immediately. We cannot ship this ball outside the United States.